This is a follow up post to my spring wardrobe trends post. After a whole winter's worth of pale skin and frizzy hair I love to have a little bit of fun with my look when the weather starts to turn nice. Being "trendy" with your hair and makeup is a bit more tricky than when it comes to your clothes, because hair and makeup on the runway tends to get a bit wackadoo. And if a "hot" lipstick or eyeshadow color doesn't look good with your skin tone, there's not too much you can do to change that. I've tried to pick a few trends for this spring that anyone can pull off, and that I think are especially fun and easy! The soft pony! Easy, no fuss hair is my speciality. I have zero hair skills. All I can do is wear my hair down?straight or up in a pony/bun. So when I see that a "messy bun" or a pony tail-do is in, it's right up my alley. 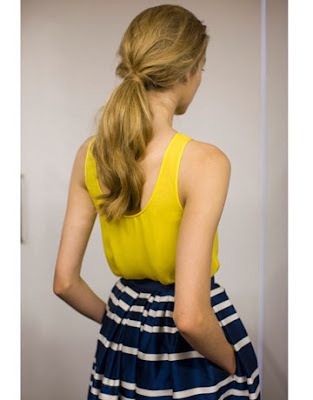 All you need to do for these glamourous and simple ponytails is comb out your hair (it doesn't even have to be clean! 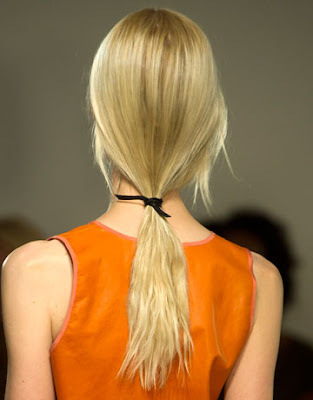 ), tie it with an elastic, give it a quick douse of hairspray and you're good to go! Add a piece of ribbon or leather around the elastic for a bit more oomph. I love a statement lip. I think there is nothing finer than a hot lipstick color and a swoop of liner. That said, bold lipstick is so hard to pull off in a hot Canadian summer, where your lipstick is more likely to end up smeared all over your face at the first sign on humidity. Lets stick to light gloss in the summer ladies. So spring is our last chance to do an awesome statement lipstick. I am not lipstick expert, so I will not try to give you a tutorial on application. Google it, there's tons of great ones out there. BUT, I will say, invest in liner. I've seen what lipstick bleeds look like and it's not pretty. Orange is huge for Spring 2012, and I'm digging it, but I know you're all thinking "Orange? Really?". 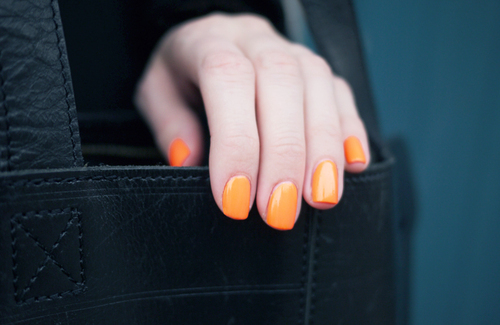 But orange can be awesome, and the right shade can work on pale skin and dark skin alike. Seriously though, this is what the girls at the makeup counters are for! They are pros. Show up, tell them what you're looking for and they will steer you in the right direction. If all else fails, get some orange nails and you'll be set. I left my favorite for last! Liner and lashes! Hurray! Nothing amps up your look like some serious lashes, and doll lashes are in for spring. I know fake lashes can be a little intimidating, but with a bit of patience and practice you'll easily get the hang of it. And if you don't, you can go to the mall and pay someone to put them on. They give your eyes some serious bang for their buck. 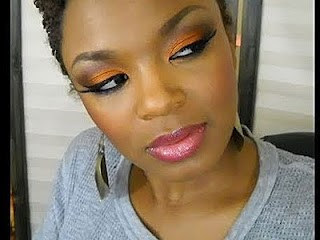 And a 60s liner is in right now too, one of the most flattering eye-makeup looks, in my opinion. Winged liner can open up your eyes and make them look huge (hence the "doll" reference). Hopefully you'll find a trend here that you can hop on board with! Let me know if you try and love (or hate!) any of these looks, and what you'll be trying for Spring!